Clark spoke to the media this afternoon. 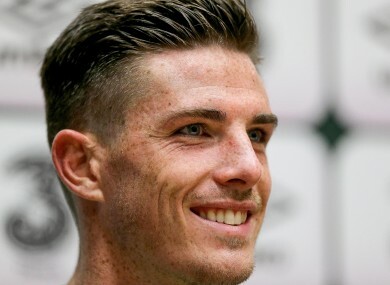 THERE’S A STARK contrast between how this season has gone for Ciaran Clark at club level and on the international stage. Having played a major role in Ireland’s qualification for Euro 2016 with two resolute performances in the play-off with Bosnia-Herzegovina, the 26-year-old again looked solid in Friday’s 1-0 win over Switzerland and scored his second senior international goal. Martin O’Neill, who managed Clark at Aston Villa as a youngster, is clearly a fan of the defender and said as much in today’s pre-match press conference ahead of the friendly game against Slovakia tomorrow night. But while he has become an important player for the Boys in Green, fortunes at Villa haven’t been quite as positive. Rooted to the bottom of the Premier League table and set for relegation to the Championship, Remi Garde’s reign in the Midlands has been a disaster thus far. Clark started the first four games of the season, but was dropped once summer signing Joleon Lescott regained his fitness. He has since found himself in and out of the team and has more often than not been on the bench — although he did complete 90 minutes in three of the last four league matches. While accepting that his current circumstances aren’t ideal, Clark is thankful to be given the opportunity to spend the week in Dublin with the international set-up. “Every player wants to play and to be on the bench is frustrating but I’ve just worked hard in training and tried to keep my head down, do the best I can and take the chance when it comes,” Clark says. “Those games (the Bosnia play-off) filled me with confidence and I’ve tried to go back and take that into club form. Through whatever reason it has been an up and down season for me at club level, but to come away and play over here is brilliant. It’s nice to meet up with the boys and the staff. It’s a different atmosphere and we all try to do our best and enjoy it. It is sure to be a frustrating few weeks ahead as Villa play out their seven remaining Premier League fixtures. However, Clark will at least have the European Championships to look forward to once the campaign ends as he is all but assured a place on the plane to France — though he’s not resting on his laurels. Email “'It's a different atmosphere' - Clark glad to put relegation woes to one side and focus on Ireland ”. Feedback on “'It's a different atmosphere' - Clark glad to put relegation woes to one side and focus on Ireland ”.